Looking for a new child aspiration? Well, I have a treat for you! 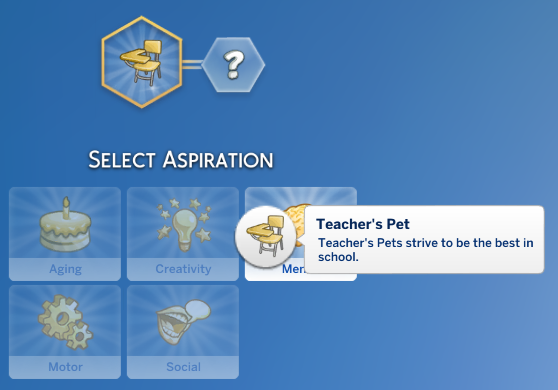 The Teacher's Pet aspiration! This is my first original aspiration I've released. The aspiration will give your child whims; though none of them are new whims. Basic things, like Become Focused, Do Homework, etc. Where else is a child going to start? 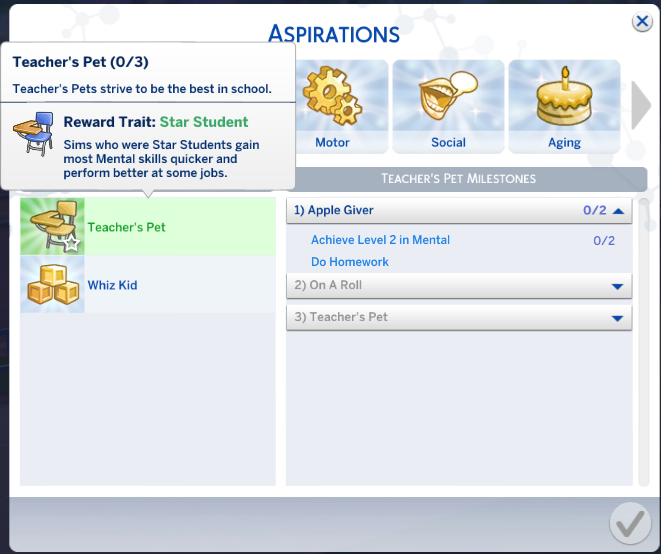 To be a Teacher's Pet you must start as an Apple Giver by doing your Homework and Leveling up your Mental skill. Your Child is going to make On A Roll with these grades. So close, almost there, just improve those grades a bit more! 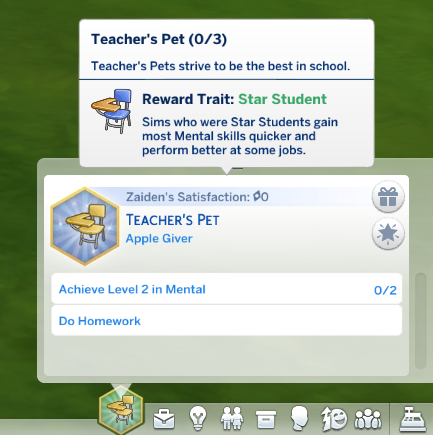 Now that your Child is a Teacher's Pet, they're a Star Student. 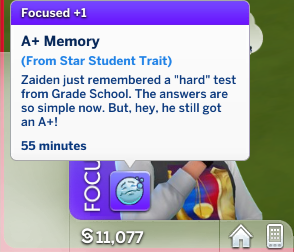 They have some of the highest grades in school! They get boosts in every skill and school. And once they get older, several jobs. 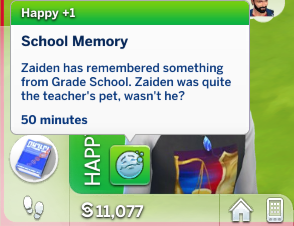 As a Teen or older, they'll get buffs such as "School Memory". This buff gives some small skill boosts. But they also get the 'A+ Memory" that makes them focused and gives bigger skill boosts. I created this aspiration as a reward to a twitter contest I had. If you have any constructive feedback, I'd love to hear it. Depending on the feedback I get, I may release an update to this aspiration. Now that this has been released, my next upload should be the Fortune aspiration. 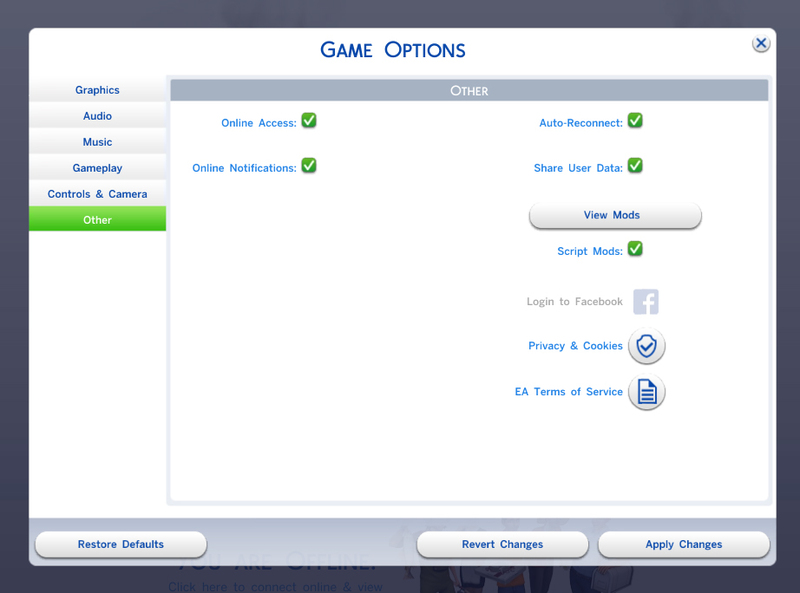 Since this is not an override, there shouldn't be conflicting with any mods.